Just as we thought we could take the weekend off, here’s some more fashion to keep our eyes glued to fashion! The Paris menswear shows are beaming with fabulous, and the girls are making an appearance here and there. Here’s some looks from Givenchy Homme with Alex Cuhna and the girls including Isabeli Fontana, Adriana Lima, and Candice Swanepoel– gone very edgy from what we are used to seeing. 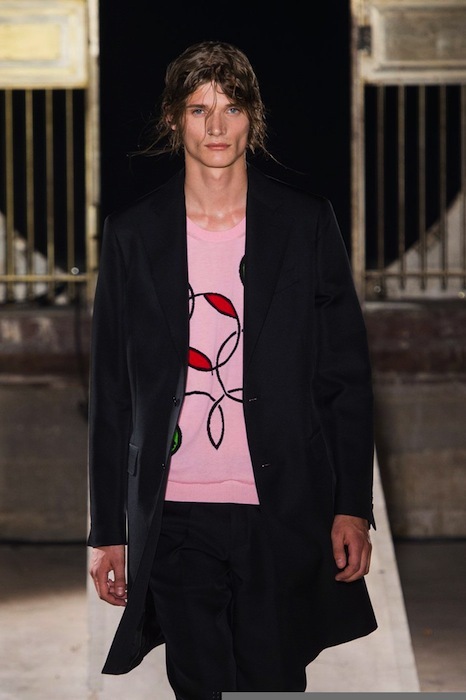 More favorites from Paris include Dior Homme, Krisvanassche, Hermes with favorite guys including Arthur Gosse, Guerrino Santulliana and Baptiste Radufe, Raf Simons, Ben Allen at patterned Valentino, and so many more. Graphics and textures abundant, Henrik Vibskov and Walter Van Beirendonck add a little funky edge to the mens runway flavor. fdmLOVES selects from Paris menswear spring 2015 runway by Brigitte Segura. check out more menswear updates here and here.